Never mind the messy, uneven slices of cobbler, crisp, cake, or other pastries. Our individual slice pan shapes and bakes a perfect wedge-shaped serving every time. 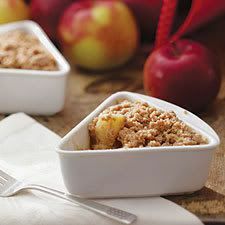 Stoneware pan is perfect for hot fruit crisp, potpie, and other treats that tend to ooze or collapse when they’re cut and served. Makes a 5” wedge-shaped serving. On the surface, it seems like a dieter's dream (which is how it was presented to me...as a way to control uncontrollable urges to eat more than one slice)....or a single person's answer to questions about how to not waste so much food when trying to cook good meals. Under the cloud of perceived awesomeness, though....who is really going to take the time to bake a pie, and only bake a 6th of it? If the person is making it from scratch, why take the time to cut the crust recipe way down like that when it takes even more effort than making the crust in the first place. And if they're taking a short cut by just buying a frozen prepared crust.....then what do they do with the rest of it? Are they really going to cut out little triangles to use for this individual serving? My first thought was "How cute!" You make a very good point. The nearest Village Inn can do all the work for me...for less $$! So funny! You completely elaborated on my thoughts of -- how do you cut the recipe down to make the one piece? What a time waster, etc.